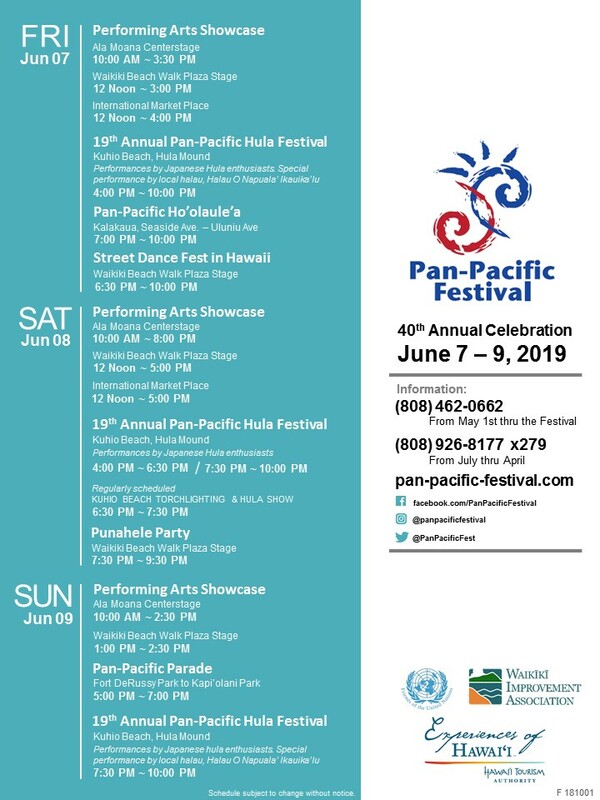 Introduced in 2016, the Punahele Party is a new addition to the Pan-Pacific Festival’s hula program. Hula dancers and their groups travel from Japan to enjoy the opportunity to dance with accompaniment by some of Hawaii’s best and most talented musical group. Participants will choose their favorite songs to dance to and perform to live music in collaboration with notable Hawaiian entertainers. The Punahele Party offers a “kanikapila” setting for performers, offering a casual and fun experience to dance when a favorite song is played by the band. Kanikapila settings are common at gatherings of family and friends, usually performing Hawaiian music or hula. This event was originally designed to incorporate the traditional Hawaiian idea of kanikapila. Performers on stage are elevated for audiences to see as they dance to their favorite mele (songs).